A range cooker is a fantastic all-in-one cooking solution. Our collection of range cookers includes gas or electric and dual fuel options. Let your range cooker create a focal point in your kitchen. Our innovative multi-function cooking technology will make meal preparation a breeze. Range cookers are popular because they’re cost effective and easy to use. Their many features make cooking and plating up meals simple. Range cookers have a reputation for only looking right in a rural home. Not anymore. 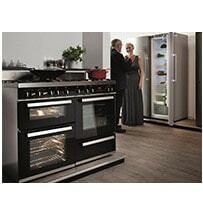 Today’s range cookers are modern and professional. Their sleek black glass and steel styling looks great in any kitchen. Added state of the art features like electronic timers and built-in rotisseries add to their contemporary feel. A range cooker is an all-in-one solution for your cooking needs. Range cookers are usually larger than your typical cooker. Most models are between 90cm-110cm wide. Range cookers contain more than one ‘cavity’ – a technical word for an oven. Usually, a range cooker will have two main cavities. These cavities are also larger than standard ovens. 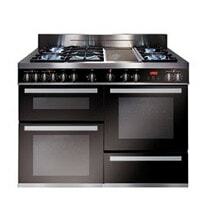 Typically range cookers will have up to 90cm cavities, compared to 60cm on a standard oven. Depending on the kitchen stove that you opt for you’ll also get a grill, a warming drawer, or both. 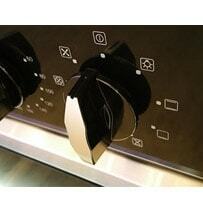 Range cookers have a built-in hob that comes with either five or six rings or burners. If you opt for an electric hob, 5 rings is the norm. Expect 6 burners if you choose gas. Gas or electric range cookers – which should you opt for? The simplest option to go for is the fuel type that your cooker currently runs on. Gas is cheaper to cook with, but switching over to gas can be costly. It may take a while to recoup the cost of installing a new gas connection. Whilst gas cookers are cheaper to cook with, electric ovens tend to heat more evenly. 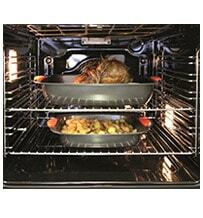 Electric fan ovens also heat up faster so you can reduce cooking temperature and cooking times. A popular choice is to go for duel fuel, which gives you the benefits of an electric oven but with gas hob burners. 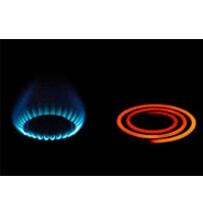 Gas hobs are popular because they heat up quickly and also cool down more rapidly after use. You may also want to consider getting a cooker hood to pair with your range cooker. How much does it cost to run a range cooker? Whilst they’re pretty hefty pieces of equipment, range cookers are reasonably cheap to run each year. Normal costs vary between £15-a-year and £50-a-year. If you’re energy efficient, try the best performing gas range cooker. The biggest consumer of energy tends to be dual-fuel. We understand that choosing the right range cooker can be tricky. That’s why we’ve created a buying guide. 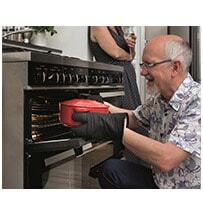 We’ll help you understand range cooker sizing, fuel types and capacity. Learn all about range cooker features and benefits, so you can make a decision that works for you.